By 1999, eBay had become America’s leading auction site and was expanding into new global markets. With its eyes on Japan, eBay replicated their US model, bought a local domain, and translated their site into Japanese. Three years after launching, dire performance forced eBay to pull out. Aside from strong local competition, eBay’s failure was due to a limited understanding of the cultural differences between America and Japan—differences that ultimately deterred users from engaging with the service. For instance, acutely risk-averse Japanese customers were required to submit credit card information immediately at signup, resulting in a high rate of abandonment. 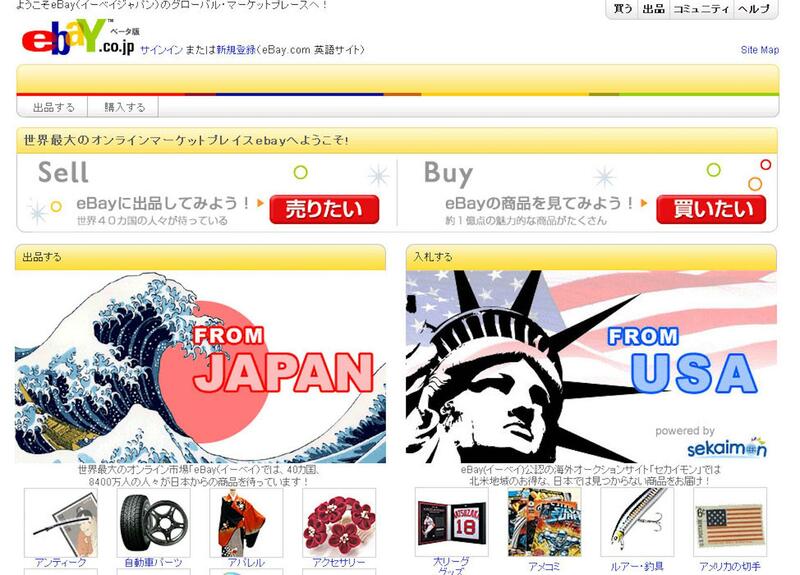 eBay's Japanese version of the American website (source: IT Media News). Expanding into foreign markets is often an effective strategy for corporations growing their international presence. Yet, even large multinationals can fail to understand the value of adapting to cultural and linguistic variations. Identifying cultural differences is vital to cross-cultural design. How Does Culture Influence Design? Power distance: the degree in which a society accepts a hierarchical order (high power distance) versus a flat hierarchy (low power distance). Individualism: in individualistic societies, people take care of themselves, while in collectivistic societies, people take care of members of their in-groups. Masculinity/femininity: masculine societies (high masculinity score) have a preference for achievements and assertiveness, while feminine societies (low masculinity score) have a preference for cooperation and quality of life. Uncertainty avoidance: the degree to which members of a society feel comfortable or uncomfortable with uncertainty and ambiguity. Long-term orientation: cultures with high long-term orientation encourage preparation for the future, while cultures with low long-term orientation value quick results and prefer to measure performance on a short-term basis. Indulgence: the degree to which a society allows members to enjoy life and have fun versus suppressing gratification of needs. Comparing cultural differences of Taiwan and America in Hofstede's country comparison tool. According to research conducted by Dianne Cyr and Haizley Trevor-Smith, cultural differences can affect eCommerce trust, marketing, technology adoption, information, communication, as well as the UX/UI of a product. If a product doesn’t adapt to cultural differences, it will not truly meet a users’ needs or create business value. Here are a set of cross-cultural design guidelines we’ve developed over the years on international teams when working on successful cross-cultural products. These principles steered us in the right direction when designing products that successfully built brand equity, fulfilled user needs, and produced a significant ROI when expanding into new markets. It’s easy to assume that two neighboring countries are culturally similar—and in many ways that’s true. But when it comes to cross-cultural user experience design, understanding the differences between cultures (even if they’re geographically close) is essential in making an acceptable product. Netherlands-based online travel agency, TravelBird, operates in 17 countries in Europe. In the first step of checkout, users select a travel package date. Depending on the local domain through which the user is accessing the website, the UX will be different. TravelBird Netherlands and TravelBird Germany are designed to suit the cultural differences between the neighboring countries. Users were expecting assurance and certainty of what they booked, so we added a list of inclusive/exclusive items, which increased the conversion rate for the German locale. Additionally, through competitor analysis, we found that German users were accustomed to judging a website’s credibility by the number of trust badges displayed, so we added them to the German Travelbird site. If two neighboring European countries have cultural differences that impact conversion rates, imagine the effect on new markets miles away from Western ones! In certain cultures, specific design patterns are accepted as universal. 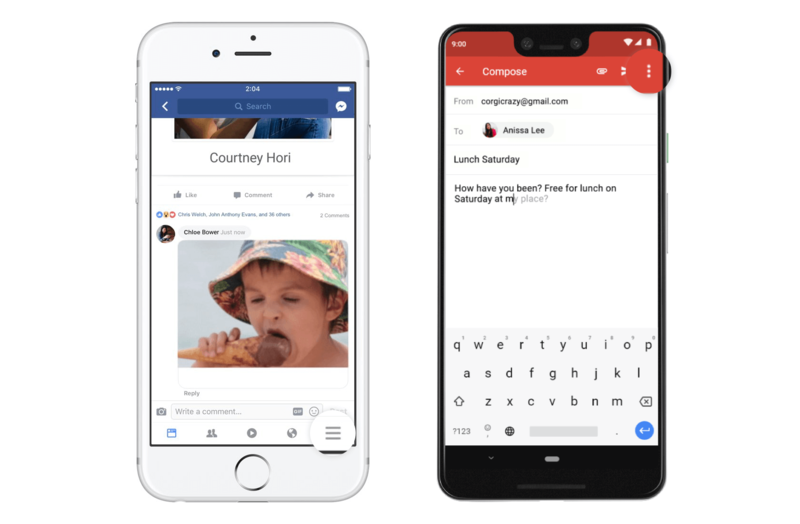 For instance, with the help of Facebook and Gmail UI designs, the hamburger and kebab menus have become the common choice for revealing navigation links and further options. Facebook and Gmail have made the hamburger and kebab menus ubiquitous. However, take those icons out of the West and into the East and users may be confused by them. The symbols don’t universally appear in UI designs around the world—at least, not in China. In research conducted by Dan Grover, former product manager at Tencent, it became clear that in the most popular Chinese apps (including WeChat and Weibo) hamburger or kebab symbols don’t exist. Instead, a “discover” button, usually represented by a compass icon, is used for the not-quite-essential extras. It’s because Chinese users see apps as an ecosystem rather than a single functioning product. To Chinese users, the action of “discovering” will spark intrigue and curiosity—which is more valuable than a straightforward here-are-more-options functionality. 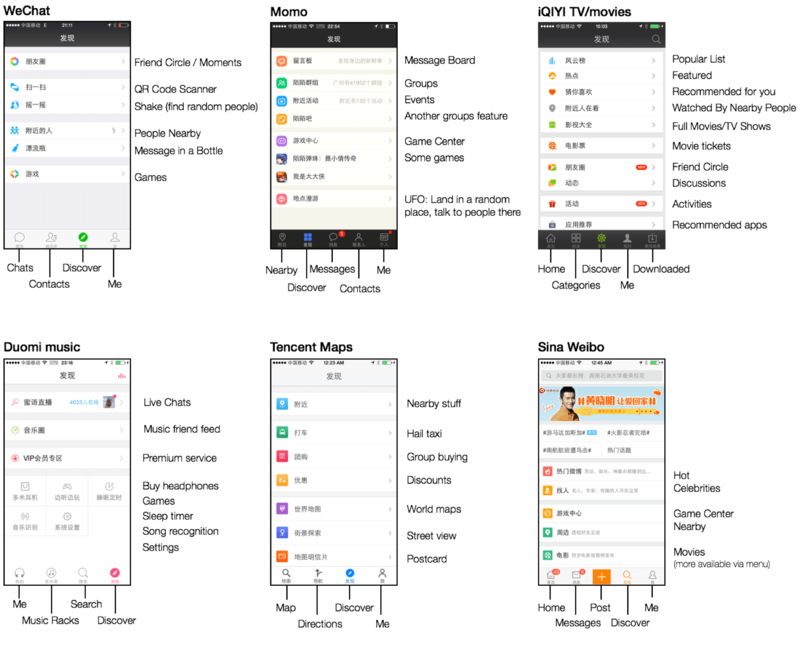 Dan Grover's collection of the 'Discovery' button in various Chinese mobile apps. It may be surprising to designers when users of a different culture react to design patterns in unexpected ways or are accustomed to alternative ways of conveying meaning or action. To understand the UI patterns of a market, a design team should take a cue from Grover and conduct a competitor and local product analysis. Hofstede’s Cultural Dimensions can offer great insight into unique behaviors. What might seem like a philosophical mindset can actually be a compass for creating a cross-cultural design. For instance, when Mozilla Firefox created localized landing pages for countries around the world, they referenced cultural psyches. The American site is minimal and clean with one clear CTA (call-to-action), whereas, the Chinese version has radically more content—banners, news, and ads that fill all available space. Cross-cultural user interface design differences between Firefox US and Firefox China. This is not due to stylistic trends but to the vastly different individualism scores of each country. America is a highly individualistic society, and US users typically know what it is they want to search for. In contrast, China is more of a collective society, where citizens prefer to read what others are reading. A portal design optimized for browsing is common in Chinese sites including Tencent, 163, and Taobao. Referencing UI patterns rooted in local culture and language is far more efficient than introducing a pattern known in the West and expecting users in the East to adapt. Without this phase of product development, businesses risk developing and designing something that is not effective in the local market. To have a deep understanding of users and local markets, both quantitative and qualitative research can provide insights into local users’ behaviors. 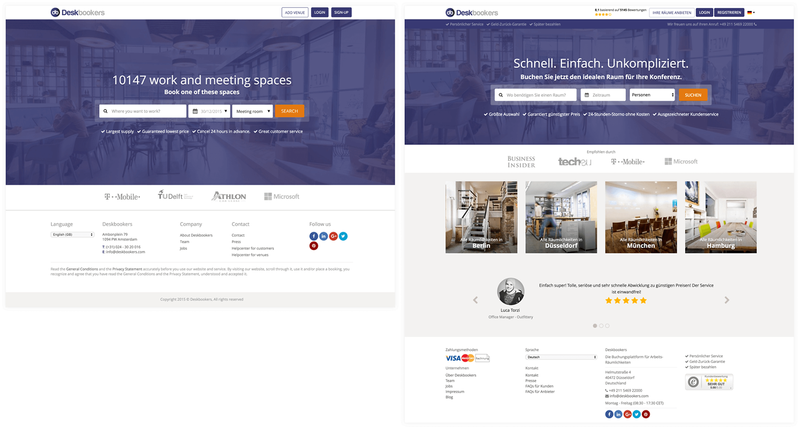 Deskbookers, a Netherlands-based online marketplace for workspace rentals planned to expand into the rest of Europe—specifically Germany. They made successful sales over the phone and in person, but the German website was not converting well. To uncover the cause, we conducted various methods of research: usability tests, interviews, looking at Google Analytics data, heatmaps, user session recordings, and academic research (i.e. credible white papers, culture, and user behavior reports and publications). Our product team developed hypotheses for why the site was not meeting users’ needs—for example, “German users need to feel confident in an experience.” The lack of detailed, comprehensive information and solid proof that the website is trustworthy helped to explain the low conversion rates. Before and after the re-design for Deskbookers in Germany. To remedy the problem, we added elements such as customer reviews, trust badges, and more detailed copy. The result? Increased conversion rates and satisfied customers. Over a period of continuous optimization, Germany is currently one of the countries with the strongest Deskbookers’ presence in Europe. Conducting quantitative and qualitative research may sound unnecessary if there’s general knowledge of local culture, but research methods will inevitably reveal nuances that aren’t always obvious—and that can improve the user experience and ROI. Languages are fascinating—take English, where there are differences in terminology for the same thing in America, Canada, Britain, and Australia. For instance, Americans say ‘candy’, Brits call it ‘sweets’, and Aussies say ‘lollies’. The company 'monthly' changed its site's terminology to make it more localized. With this insight, we localized copy based on the common terminology for each country and cross-correlated our data with Google Trends. Instead of translating content literally, we found the most effective way to communicate with local users was by using their unique terminology. If a product is positioned to be local, copy must be written or evaluated with the knowledge of national and regional language nuances. Many companies resort to machine translations to save on time and cost. However, machine translations are hard to get right if the appropriate technology or vendor isn’t used. A Dutch business wasn't translated into Chinese by a local writer, resulting in mistakes. To a foreigner, the Dutch phone number format is hard to read and may look like a string of random numbers. ‘M’ stands for “mobile” in Western languages, but means nothing in the Chinese language. When writing copy for different cultures, it’s always best to consult a local copywriter or someone from that culture. It’s easy and free to use Google Translate, but relying on machine translation risks making businesses and products appear questionable and careless. If the target audience for a product is wealthy tech employees based in San Francisco, it may be reasonable to assume that the majority of users have the latest iPhone—making it easy to design for that particular device. However, when designing for a new market, it’s important to avoid assumptions and start with research. SMART is a leading Filipino telecommunications company that designed a mobile app for its loyalty program. We began by conducting research and found that 41% of users have versions of the Samsung Galaxy with very similar screen sizes. Equally notable, most were on WAP phones with low connection speed. Instead of assuming people owned the latest Android phones, research made it clear which phones Filipino users actually used. 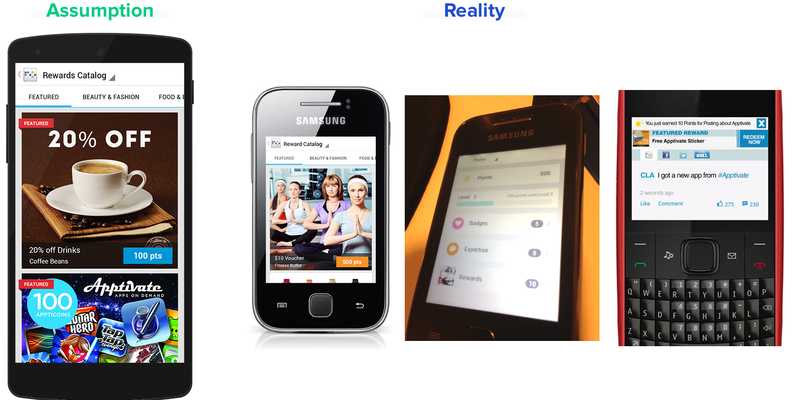 If we had jumped right into high-fidelity designs without understanding what phones users had, SMART would have launched an unusable and irrelevant product. Instead, equipped with market research, we developed a product that was formatted for the right screen size and designed to load quickly with minimal connection speeds. By identifying a market’s primary devices and connectivity stats, a design team can effectively produce a design that harnesses the environment in which it’s used. Without market research, a product might be designed in vain. Localization and adapting a product to a local culture may seem like an unnecessary amount of effort. But with consumers becoming savvier, it helps brands authentically fulfill the needs of customers around the world. Not only that, the business value of localization is surprisingly high. According to Localization Industry Standards Association, the potential return on investment for localization is $25 for every dollar spent. Net Media Planet reported their clients saw a 20% increase in conversions when website content and paid ads were localized for their international markets. That percentage shot up to 70% when entire websites were localized. As global brands like Netflix, Starbucks, and IKEA invest in localization by employing specialized teams all over the world, there is no doubt that creating a cross-cultural design makes international users more likely to adopt and stay loyal to localized products. What does the user interface do? Within a digital product, a user interface (UI) is made up of the visual elements a user interacts with. Buttons, colors, typefaces, and layouts are UI elements created by a UI designer. Design patterns and style guides are often used to make a user’s experience consistent, reliable, and intuitive. What are the three types of user interface? The three contemporary user interfaces are Graphical, Menu Driven, and Natural Language (Command Line and Form Based are alternatives). Graphical UIs consist mostly of visual elements. Menu-Driven is a step-by-step process of very basic interactions. And Natural Language is emerging through voice-interactions. What does AB testing mean? AB testing refers to the use of two versions of the same product (A and B) when testing. Each version is shared with users in equal amounts and the interactions of each are measured to see which version of the product is more successful. Qualitative research methods are characterized by their exploratory and unstructured qualities, consisting of methods such as conversational interviews, observations, and open-ended questions. Alternatively, quantitative research is based on measurable figures and closed questions. What is quantitative research method? Quantitative research methods are characterized by their objective measurements and numerical analysis, consisting of methods such as closed question surveys, data collection, and demographic analysis. Alternatively, qualitative research is based on exploratory and unstructured approaches. Jenny is an award-winning UX strategist who helps startups and enterprises create new business value with innovation, global expansion strategy, and customer-winning UX design. She has worked with startups and brands including Neiman Marcus, Crate&Barrel, Randstad, and eBuddy. She defines product/UX strategy and designs user-centric experiences for travel, eCommerce, and SaaS businesses. Jenny also teaches design at universities and conferences.